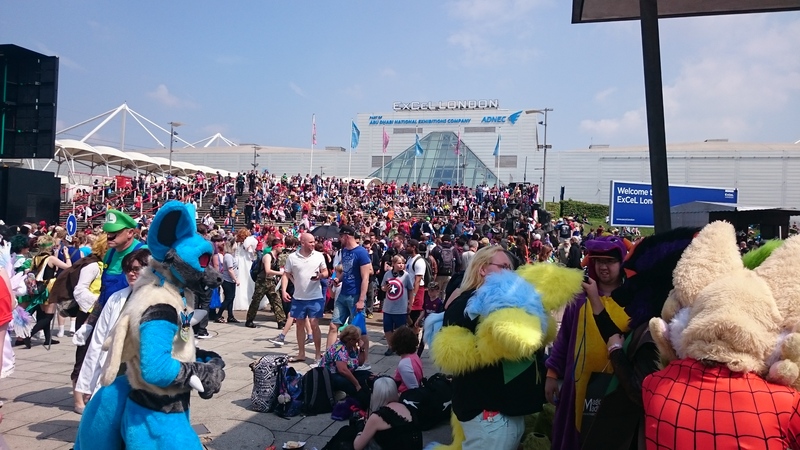 This was the first time my wife and child had come to a convention. Due to myself getting hospitalised last October, my wife had treated me to a stay at Aloft. The best part to this was cosplay spotting from the hotel room window. I went to the foyer and discovered the staff did not know where the milk was for the cereal, they could only find one boul and a card tub for eating out of. Nobody knew what they were doing. I was very disappointed in how the staff treated us as if we were the problem for asking simple questions that they had no answers for. 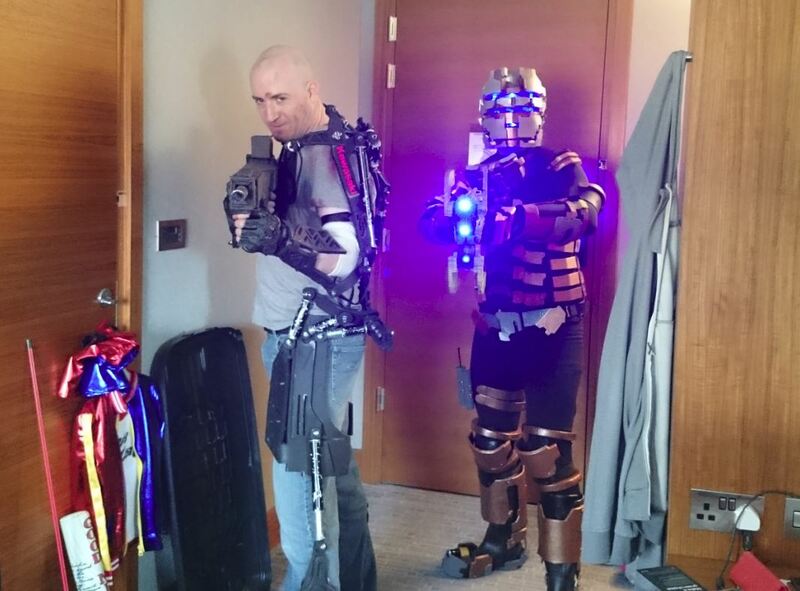 Now having a hotel room it was much easier to dress in my EA games Cosplay. 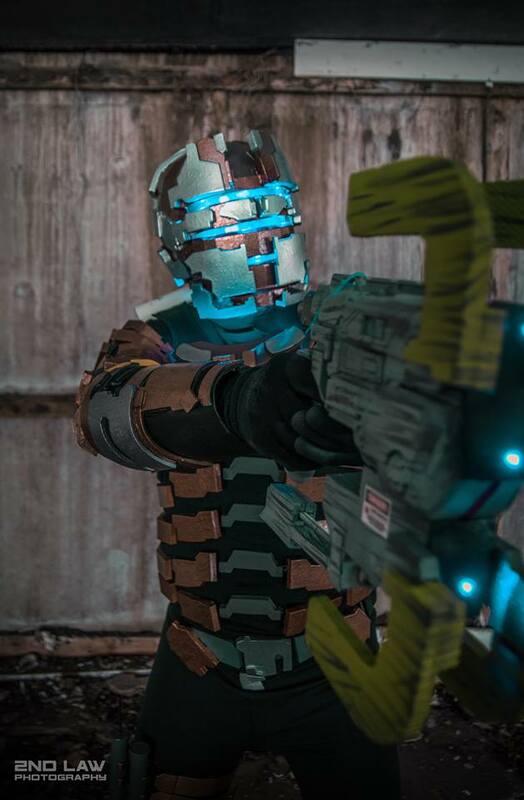 Isaac is becoming one of my favourite costumes. He’s an easy wear and with all his lights on looks cool! 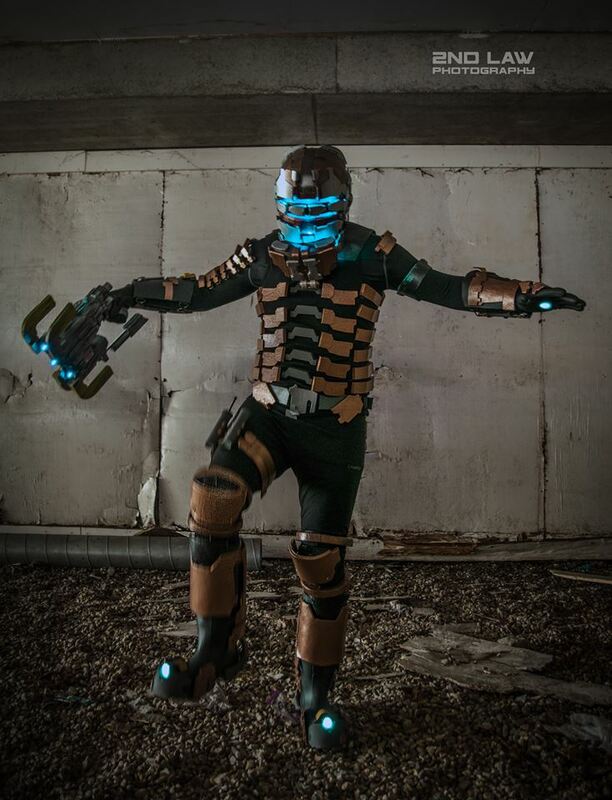 Bluejam77 was taking out his old Elysium cosplay for one last spin before retiring him. 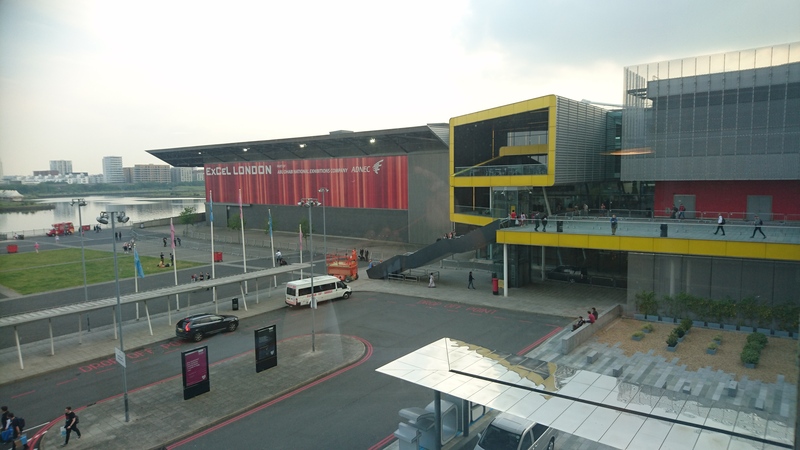 As we left the hotel again I noticed the difference in the atmosphere being at the other end of the Excel centre. A few cosplayers could be seen in the hotel but I could tell the staff did not fully approve or shall we say; did not get it. Having already queued the day before I thought I would be allowed down the express lane. No. The staff said I needed to go through weapons check. I pointed out that I did not have anything that looked like a gun. The foam Plasmer cutter was obviously not real. “You have to queue again mate”. I did so just to be laughed at by the weapons check guys. “This ain’t no gun!” I replied “I know” “You don’t need to come here, You can go” I then had to make sure he tagged the weapon. ” You don’t need a tag,” he told me. “Tag me anyway so I can come and go as I please” To this, I got my blue zip tie! It’s a Full house… Or is it? It was a lot busier today but they were still selling tickets at the door. Usaly its always sold out. I could hear the public complaining about the cost of the tickets. 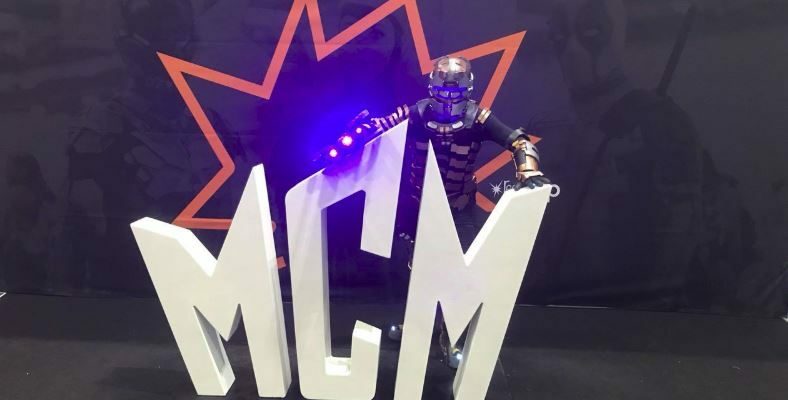 This was the first thing spotted on social media after the MCMExspo was bought by ReedPop. I still have a good feeling about the new company, something about ReedPop still makes me feel like its a good move. Time will tell. It was my 7-year-olds first day at her 1st con. 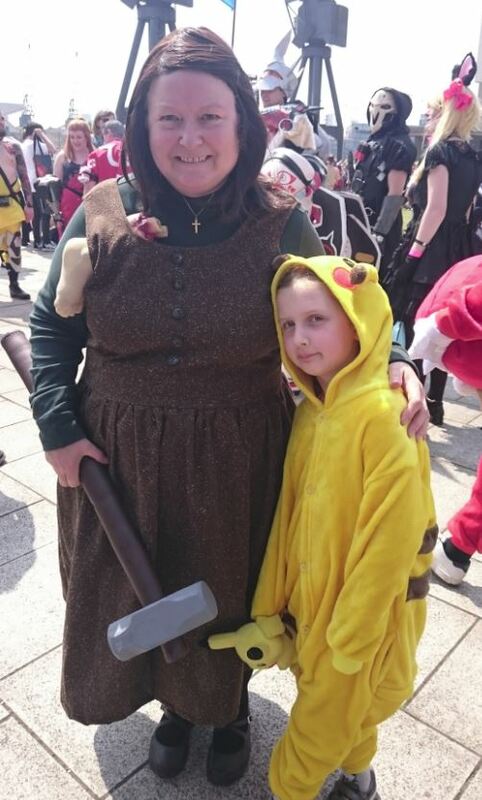 Today she was Pikachu! Also, my Mother was here as Annie Wilkes from the 1990 film Misery. She and handmade her costume, even finding the same material that was used to make the dress in the film. Also, she had made an EVA foam sledgehammer. My Father was the 11th Doctor with a sonic screwdriver that I had 3D printed only days earlier. This is where things fell apart a bit. We all went outside for photos and I was meeting up with 2nd Law Photography for a photo shoot of Isaac. Bluejam77 was having a photoshoot in his day 3 cosplay at the Fallout meet, he needed help getting into his cosplay. My father went with him with my phone and money. Time to cook in the sun with no drink! Luckily I found my mother and she supplied me with water. 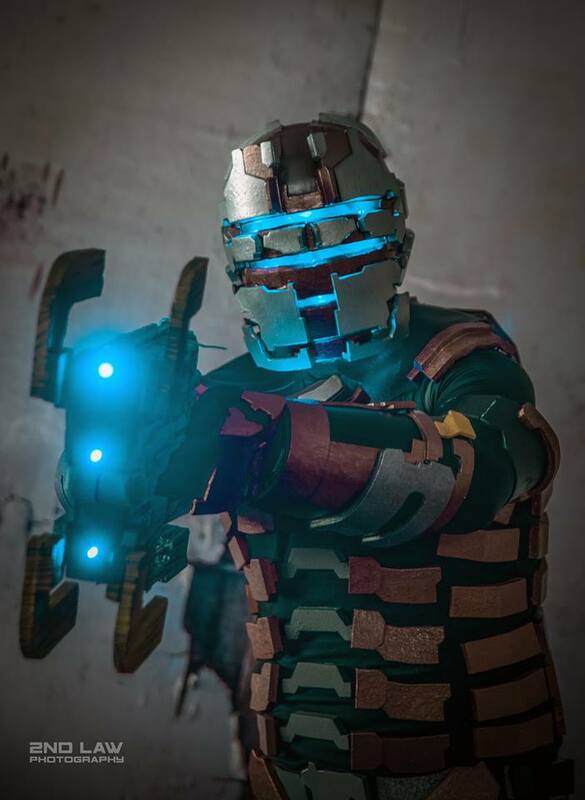 I got some photos taken and it was great meeting up with Lee, 2nd Law photography. Again he worked his magic! Maybe Isaak will be my next CosCard. I lost everyone so went for a walk around the Excel Center. I checked out the stalls and got lots of photos taken. Then I found my British best friend Craig with his fiancée Amy and my wife and child. We went for a walk and then Lara Croft runs up to me. It was the talented cosplayer Kaldorei Cosplay. Kaldorei has become one of my con buddies and it’s always great to see her work. She was still contemplating competing in the Sunday show. Will she enter? 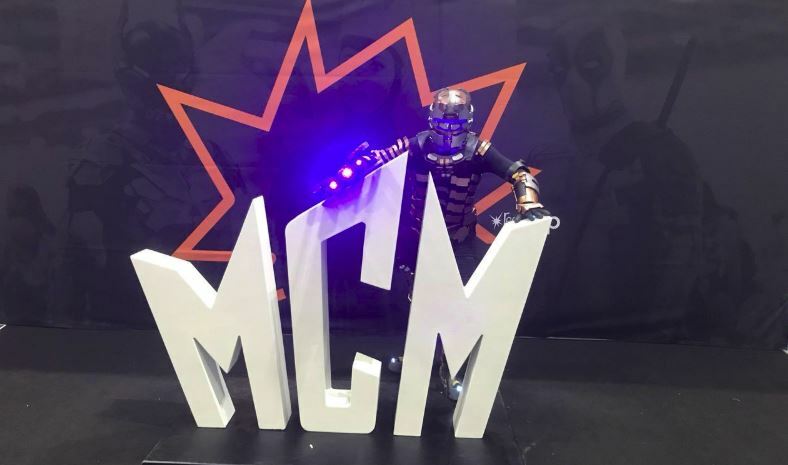 Then I found the MCM letters! Photo time! My family went back to the hotel as it is a big venue. I went for a walk around, checking out lots of things I had missed. I was keeping an eye out for the Marvel stand as I wished to get a picture looking at Iron Man comice in my MK1 the next day. I never found them. I bumped into my father and Bluejam77 who was now dressed in normal clothing as he had finished a Fallout meet. It was 5 pm. We decided that was enough for one day as tomorrow we were taking out the big boys and competing in the masquerade. 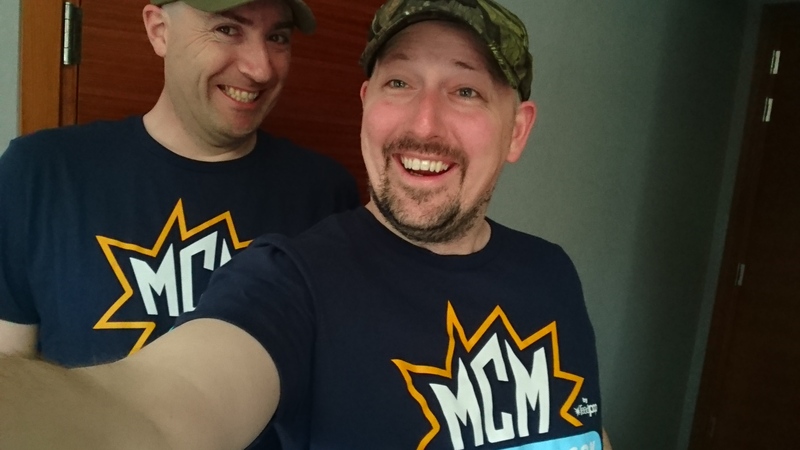 The day before I bought my MCM Tshirt so I changed into it and meet Bluejam77 and Craig in the bar to relax and chat. Oh dear… we were shirt buddies. 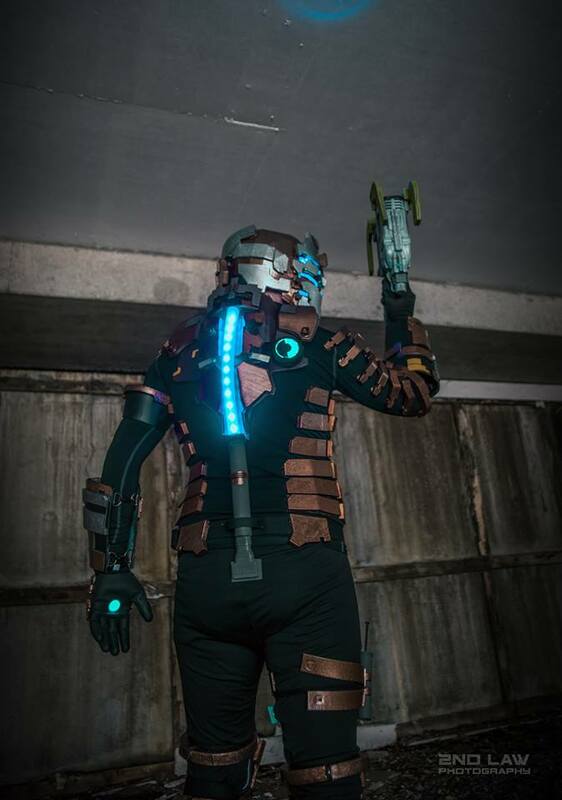 This entry was posted in CONVENTIONS, COSPLAYS and tagged conventions, DeadSpace, Isaac Clarke, mcmLDN18, ReedPop, watchthisdeadspace. Bookmark the permalink.